Three new Lego figures - all female scientists - have been unveiled. But why does the toymaker's portrayal of women provoke such controversy? A palaeontologist, an astronomer, a chemist - into the pantheon of children's toys stride three new Lego characters. Not so surprising. Except the scientists are all female. In the context of criticism of endless pink-branded items for girls and sexist child marketing, Lego's new range - Research Institute - could be significant. Toy shops often have a girls' section devoted to dolls, craft and cleaning, says Dr Heather Williams, a medical physicist and co-director of campaign group Science Grrl. In contrast, boys are offered science, construction and war. Stereotypes are ingrained early, she argues. "Young girls are cast in caring roles and boys as go-getting protagonists. I don't think that's healthy." Lego finds itself a key battleground in the debate about toys and gender stereotyping. Not only is it the world's second largest toymaker - behind Mattel - but a firm associated with a wholesome, Scandinavian view of childhood. The Danish company was heavily criticised for Lego Friends, a range aimed at girls launched two years ago. It features five women who live in the fictional area of Heartlake and includes a salon, a vet, swimming pool and convertible car. Critics attacked the pastel colours and life of leisure led by the characters. They said the range lacked the educational "construction" element of equivalent products aimed at boys. And in February this year, seven-year-old Charlotte Benjamin wrote an angry letter to Lego - soon widely publicised - about the lack of strong female characters. Education minister Elizabeth Truss said gender-specific toys risked turning girls off science and maths and urged parents to buy their daughters Lego to get them interested in engineering. The new range of scientists was released online last week and has sold out, with another batch to be made available later this month. The company denies the set is designed to mollify feminist critics. It points out that the new range was an idea voted for by the public. 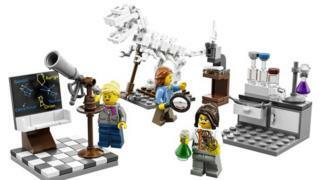 The Research Institute set was proposed by geoscientist Ellen Kooijman and backed in a public vote on a Lego crowdsourcing website. Kooijman has written that she wanted to counter "a skewed male/female minifigure ratio and a rather stereotypical representation of the available female figures". She is pleased with the result. Lego hardly altered her designs although it did add make-up, something "she strongly discourages" in the lab. But she has no objection to tweaking it for children in this way, she says. So what do feminists think of the female scientists? Becky Francis, professor of education and social justice at King's College London, who was "very, very disappointed" by Lego Friends, is a fan. The set shows women doing intellectually demanding jobs. And she believes Lego has "put a lot of thought" into getting their appearance right. They wear trousers and look practical or punky rather than glamorous. At first glance one might "groan inwardly" at the figures' lipstick and the fact one sports a pink scarf. But it's a useful way of banishing the "bluestocking" image of women doing serious jobs, she argues. Others say that Lego should return to its 1970s and 80s approach of not targeting by gender. A piece earlier this year in Huffington Post generated a surge of interest when it compared the marketing posters of previous decades with the marketing for Lego Friends. In those earlier days, the posters showed girls in baggy clothes holding complicated constructions with catchlines like "Look what I built with Lego!" Feminists argue the emphasis has gone from construction to hair and beauty. Megan Perryman, a campaigner at Let Toys Be Toys, says Lego did have some positive female characters, such as in the police and fire brigade. But it's about proportions. "There are still far more male figures in action roles. And our main concern with Lego comes down to marketing and the way that girls and boys are so rarely shown playing together with the same toy the way they do in real life." David Robertson, a former Lego professor of innovation at Switzerland's Institute for Management Development, says such criticisms are unfair. "If Lego was still marketing sets the way it used to, it'd be out of business." In his book Brick by Brick, he details the company's fear in the late 90s that Lego would soon be obsolete. The patents were out of date and a new approach was needed. Instead, the company focused on stories, which in practice meant tie-ins like Star Wars and Harry Potter. Today it is the fastest growing toy firm in the world, Robertson says. For him, Lego Friends was justifiable. The company had become too focused on boys and needed to adjust to offer the kind of characters that girls are drawn to, he says. "If you believe Lego is a healthy toy for kids to play with, why not make different stories that appeal to different people?" In the age-old debate over how children are raised, the humble Lego brick has become a powerful symbol.